Nokia today announced three new smart phones in London. The new E7, C6 and the C7 are all powered by the newer Symbian OS which Nokia claims have brought significant increase in speed and “ease of use”. 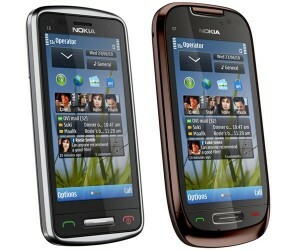 The three smart phones, the Nokia E7, Nokia C7 and Nokia C6 are all loaded with Ovi music services and apps. Nokia E7 is being pushed ahead as Nokia’s business smart phone which runs Microsoft Exchange ActiveSync. The Nokia E7 also has a 4-inch touchscreen display and a full keyboard. Nokia wisely has the Nokia C7 targeted towards the social networking populous and the smart phone is loaded with apps that let you get live updates from Twitter and Facebook. The Nokia C7 comes with a 3.5-inch AMOLED screen. The Nokia C6 comes with a 3.2 inch touchscreen and includes Nokia’s ClearBlack technology which improves outdoor visibility. Both the Nokia C6 and the C7 have a 8 mega-pixel camera and can record 720 p resolution HD video. All the three phones, the Nokia E7, Nokia C7 and Nokia C6 are expected to begin shipping before the end of the year and will include an updated Ovi Store. They will cost €495, €335 and €260 respectively.